p. Ds. Clinton, Magnus Admirallus Anglie. HODIE 3a vice lecta est Billa, for the Confirmation of a Subsidy granted by the Clergy, que communi omnium Procerum Assensu conclusa est, (fn. 1) et missa in Domum Communem, per Magistrum Brooke, Servientem ad Legem, et Solicitatorem Regium. 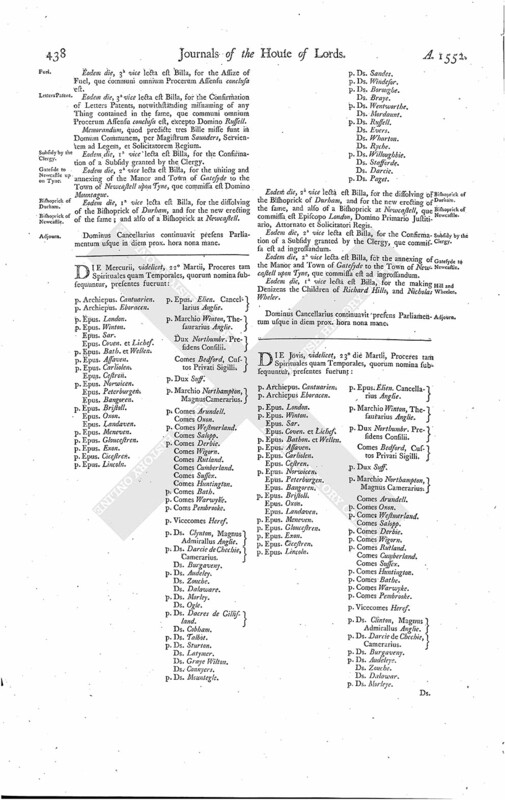 Eodem die, 3a vice lecta est Billa, for the annexing of the Manor and Town of Gatesyde to the Town of Newcastell, que commissa est Domino Mountague. Eodem die, 1a vice lecta est Billa, for the Continuance of certain Statutes. Eodem die, 2a vice lecta est Billa, for the making Denizens the Children of Richard Hills, and Nicholas Wheler, que commissa est ad ingrossandum. 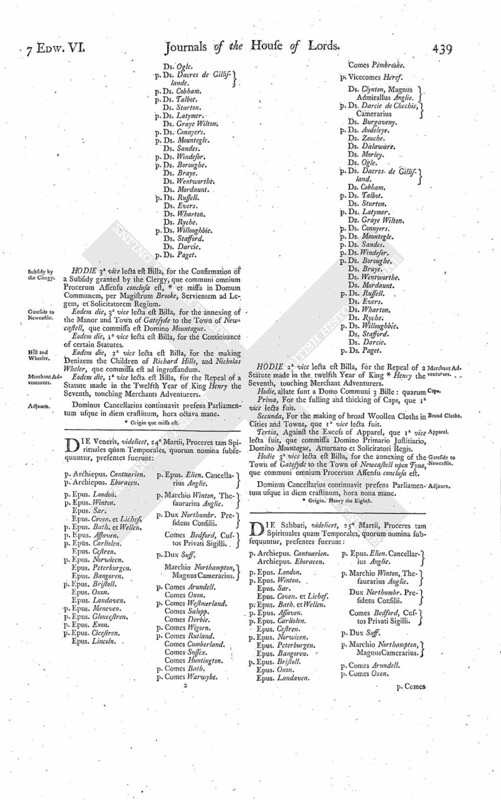 Eodem die, 1a vice lecta est Billa, for the Repeal of a Statute made in the Twelfth Year of King Henry the Seventh, touching Merchants Adventurers. Dominus Cancellarius continuavit presens Parliamentum usque in diem crastinum, hora octava mane. 1. Origin que missa est.